Like last year, this year also Thamizhini scared very much for crackers sound. Last year she did not know what is happening, but was frightening too much. But this year she was seeing how crackers are burst and still scared for the sound. Anyways she likes to hold sparklers in her hand but still frightened for bursting sounds. 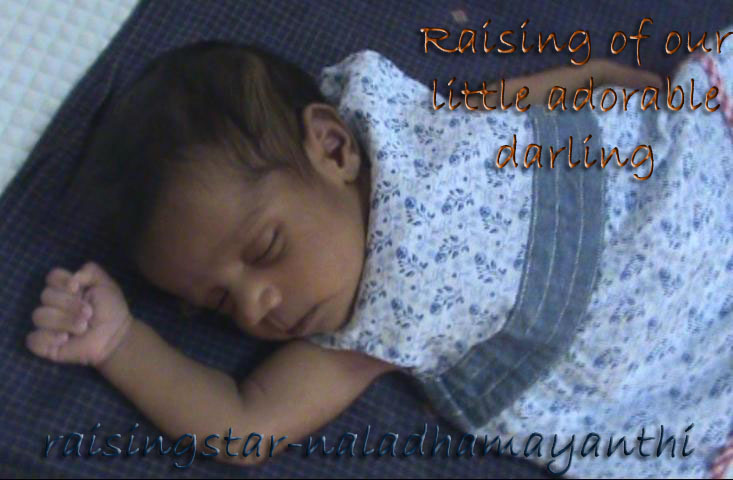 Somehow Maama -ve Ice pannanum....else he will scare me much!!! This year celebration was in my Anna's new house at Bangalore. It was not a planned trip, in last minute my brother told me that he is not coming, so we thought we will go there and celebrate. We started early morning to Bangalore on Tuesday and reached there by around 9:30 AM. The travel was too good even though we were worried about raining. Thamizhini was enjoying the travel and was looking left and right even in the dark and was telling Car and Lorry all the way. In the night, Anna's friend family had come for dinner and their son named Rupesh joined Thamizhini to play and celebrate Diwali. That night was really fun filled one. I cannot forget it. 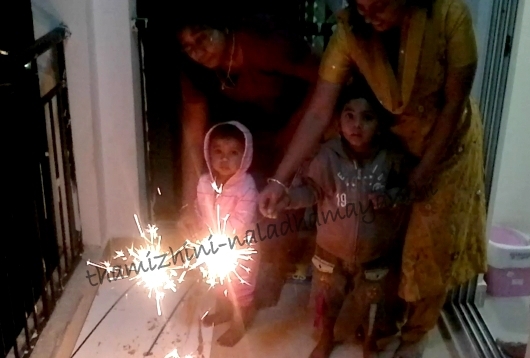 Thamizhini wanted to hold sparklers in her hand till it goes off. The little one does not have fear at all and never understand what we say. I'm not scared! But Amma. She is not allowing me to hold sparklers in my hand!! After darshan we came back and changed our outfits to casual one and marched to Rupesh's house for Lunch. It was a grand lunch and we had good time there. As we chit chatted for sometime, both Thamizhini and Rupesh spent time by playing and of course, fighting for the Car to go ride! Free ride in Rupesh Anna's Car!!! Discussing..... (Look at Thamizhini...) and that black dress is Sona!!! Thanks Sona aunty for all the Photos!!! 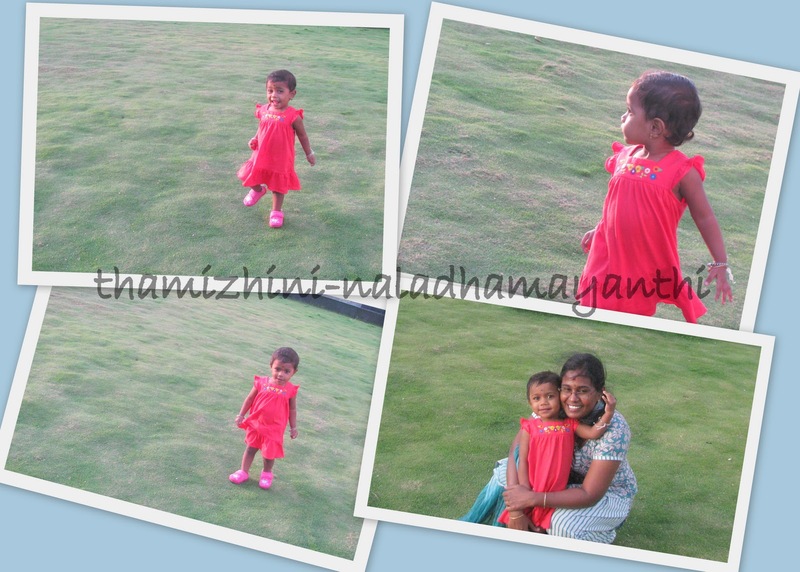 Thamizhini is looking damn cute ..